Let’s take a closer look at the XL2540 in our full review. 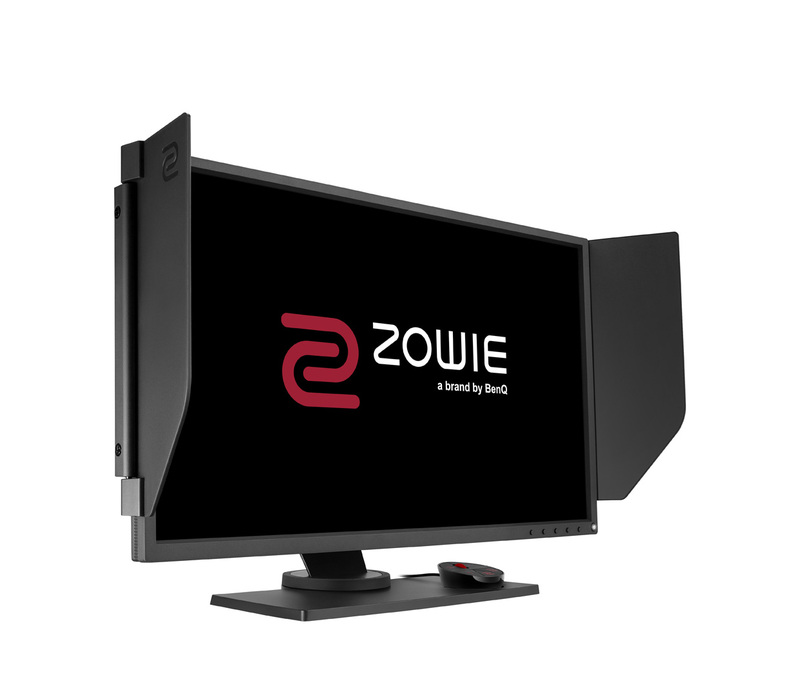 The XL2540 offers a continued evolution of BenQ / Zowie’s line of gaming monitors. As expected, we have a bright 24.5-inch TN panel surrounded by a bezel of moderate thickness. 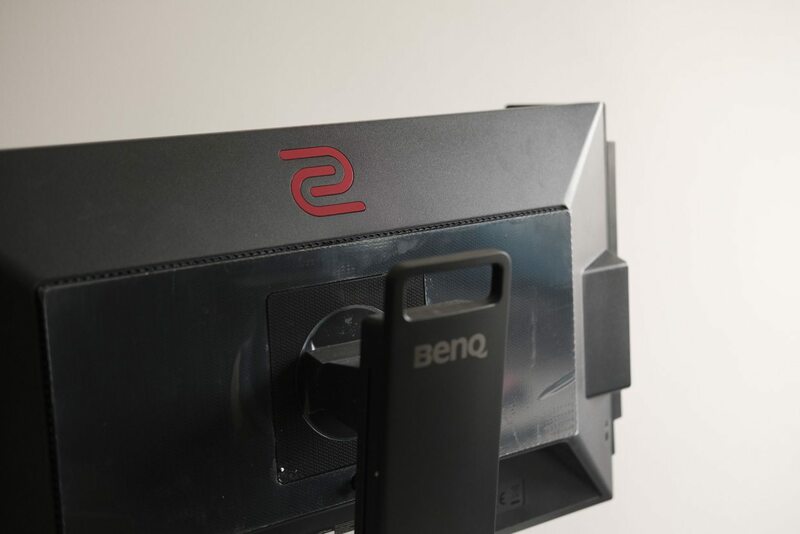 There’s no BenQ or Zowie logo on the front of the monitor, and the shape of the bezel has even been optimised to minimise distracting reflections. In the bottom right, we have the power LED and a quintet of front-mounted OSD buttons. I love front-mounted buttons, because they make it so much easier to change settings without getting confused about what each button does — something that’s commonplace for side or rear-mounted buttons. 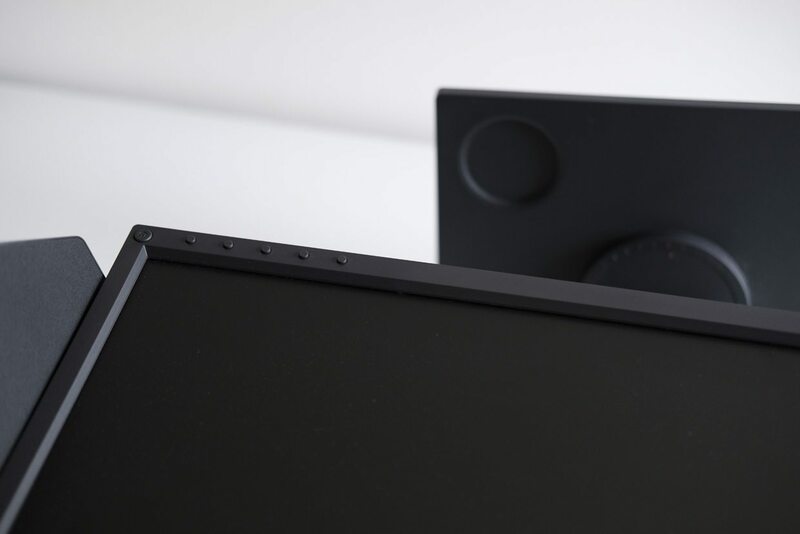 As in keeping with the rest of the monitor, the LED can be turned off or dimmed from the OSD, and the matte black buttons are hard to spot once the monitor is turned on. On the left and right sides of the monitor, you’ll notice a couple of rubber grommets. These conceal screwholes for the monitor’s shield, which can be attached to block out anything distracting from entering your peripheral vision. You can have these wings facing towards you at a right angle to the display, in line with the panel or pointing behind so they don’t get in the way. The only thing they disturb is access to the headphone holder and USB 3.0 ports on the left side, but it’s not a dealbreaker. The monitor is supported by a metal stand, also matte black apart from a dull red circle cut into the centre. The stand is highly adjustable, supporting 140mm of vertical movement, 90° of pivoting, 45° of swivelling and 25° of tilt. 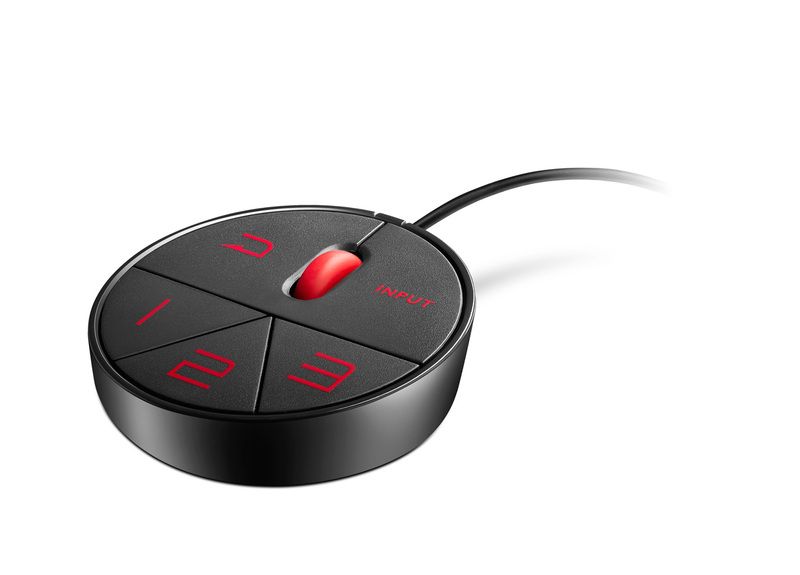 Better yet, your chosen height, tilt and swivel is indicated with red markings, so you can easily return to your favourite setup — ideal for feeling as comfortable on LAN as you do at home. 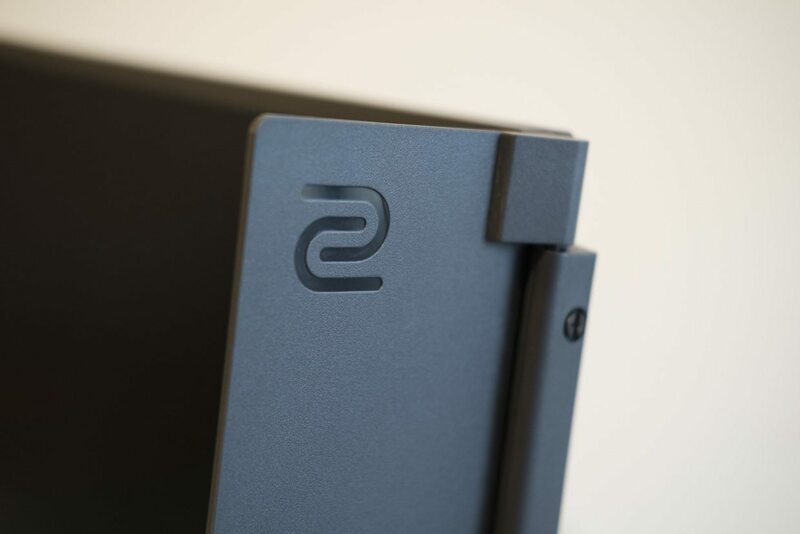 The base of the stand is rectangular, with a small inset circle that houses the monitor’s OSD controller. The puck-shaped controlled has five buttons with a scroll wheel, making it easy to rapidly change up your monitor’s settings when necessary. This connects to the monitor via a Mini USB port. Speaking of ports, there are quite a few here on the back of the monitor. We have a pair of HDMI ports (one HDMI 2.0, the other HDMI 1.4), DisplayPort 1.2, DVI-DL, USB 3.0 in and a pair of 3.5mm ports for the headphone passthrough. You’ll need to use the HDMI 2.0 or DisplayPort 1.2 ports to unlock that 240Hz refresh rate that’s the unique selling point of this monitor; we used DisplayPort. All of the ports are downward facing, but the presence of legends near each port at least ensures that plugging in isn’t too challenging. 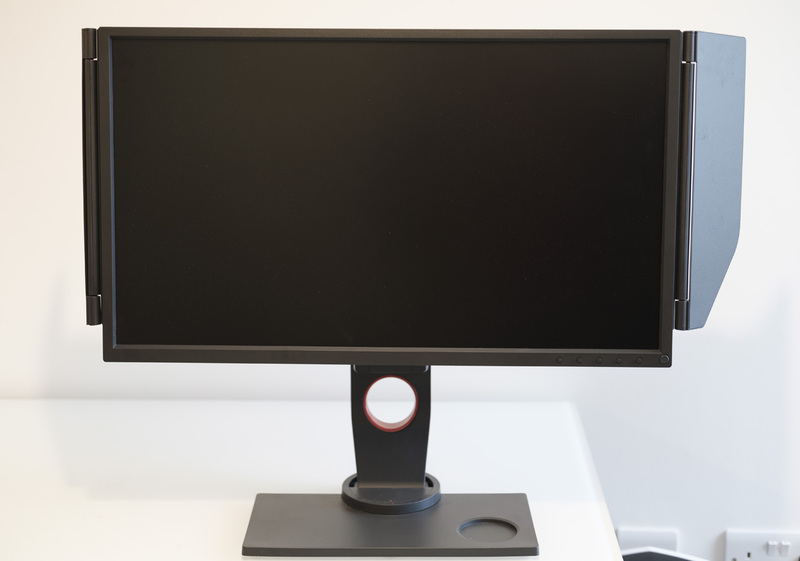 Overall, the BenQ XL2540 is a good-looking monitor with a heavy emphasis on usability. It’s not the thinnest monitor with the tiniest bezels, but that’s OK — this monitor is designed to make your in-game avatar look good, not you. We used the XL2540 for a period of two weeks, testing it both in-game and for our usual lines of work (writing, editing and photo editing). Let’s cover gameplay now, as this is a gaming site first and foremost. Gaming performance: is 240Hz worth it? The biggest question we had was ‘can you actually feel a difference between 240Hz and 144Hz?’ After all, moving from 60Hz to 120Hz is a massive jump, particularly in fast-paced and competitive PC games, but 120Hz to 144Hz or 144Hz to 165Hz is fairly minimal; we’ve struggled to notice these extra hertz in a blind trial. Happily, 240Hz is indeed a noticeable improvement over 144Hz — as long as you have a powerful enough PC to hit that 240 frames per second target. 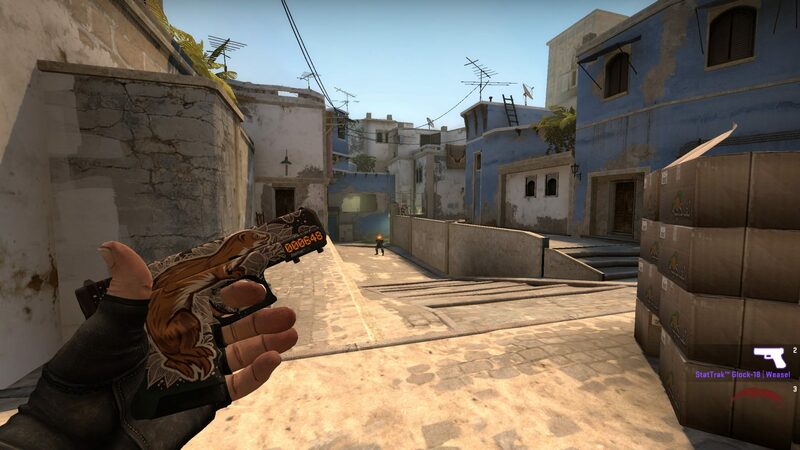 Particularly in our Counter-Strike: Global Offensive testing, we found that the higher refresh rate made it easier to lock onto rapidly-moving enemies and the game felt much more fluid. It’s the same story as moving from 60Hz to 144Hz: after you’ve tried it, it’s really hard to go back! Having said that, there is one major drawback: hitting 240 frames per second consistently can be a challenge, particularly in newer games, even if you have a pretty monstrous PC. Our current test rig has a GTX 1080 GPU and an overclocked, water-cooled CPU, and we were nowhere near hitting 240 fps in games like Deus Ex: Mankind Divided. It’s esports titles like CS:GO, DotA 2, League of Legends and Overwatch that these high frame rates are actually achievable, so these are where the monitor will actually provide a noticeable benefit over a standard 1080p 144Hz monitor. Indeed, we switched back to playing Deus Ex and Civilization VI on our standard 1440p 144Hz monitor, just because that extra frame-rate wasn’t really helping and we’d rather enjoy the scenery at a lower frame-rate. Of course, this monitor is not just a single spec, so it’s worth discussing how the monitor’s other features contribute (or not) to a good gaming experience. Probably the biggest bonus is the OSD display, which includes myriad settings and toggles that can make you feel more comfortable and even improve your in-game performance. BenQ’s advertising can be a bit over-the-top when presenting the benefits that each of these features provides, but it’s inarguable taken together, there are some solid options here that can help out in certain games and situations. Take the ability to lighten dark areas of the screen for example; this may well help you spot lurking enemies. Maximising your vibrance settings in-game is a common CS:GO trick used by the pros, and it’s built right into this monitor so you don’t have to go fussing with your video card’s settings. Some people worry about blue light disrupting their sleep patterns, and instead of installing f.lux you can quickly toggle this using the OSD controller or the front-facing buttons when required. Individually these settings are all nice to have, and there are enough of them together that there’s a good chance that at least one of them will be something you make use of on a regular basis. It’s a similar theme with the remaining features of this monitor. The wings are cool; we can definitely foresee a situation, particularly at a LAN party, where blocking out your peripheral vision would be useful. The adjustability is nice, particularly the height adjustment, and it’s easy to record exactly what settings you settle on. The carry handle is good for actually bringing your monitor to a LAN safely. There’s a good selection of ports here, so you can plug in some games consoles if you want to, or use this monitor with older PCs that don’t have DisplayPort or HDMI outputs if you really need to. All in all, BenQ have crafted a good set of gaming features and functions, and they’re a definite benefit that inspire brand loyalty. We’ll keep this brief. 1080p is not ideal for a single-monitor setup; it’s a struggle to fit two windows side-by-side, making it difficult to multitask effectively. 1440p is really where things get good, and the relatively low density makes text blurry and images grainy as well. However, there are some bright points too: the colour reproduction is both uniform and good (for a TN panel), viewing angles weren’t an issue in our testing, and that built-in blue light reduction mode seems useful (if you don’t have f.lux installed). You probably won’t be able to trick your IT department into buying one of these for you to do your spreadsheets on, but you’re not totally sacrificing your ability to do work by choosing it as your only monitor either. We performed benchmarks using, as usual, our Spyder4Elite colourimeter running software 4.5.9. The monitor was calibrated to 120 nits and 6500K colour temperature, then the benchmarks were performed. 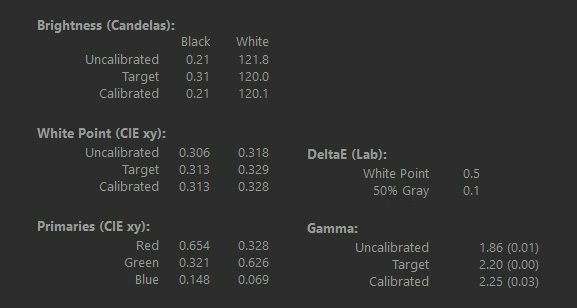 Right off the bat, we can see that the monitor is really close to ideal right out of the box, with super low Delta-E values of 0.5 for White Point and 0.1 for 50% Gray. The monitor’s colour gamut is also reasonable, covering 97% of sRGB. That’s not good enough for professional work, but it’s better than most TN-panel monitors on the market today. The 73% NTSC and 75% AdobeRGB ratings are similarly good if not great, but these standards are little used in comparison to sRGB. The measured gamma was 1.8, corresponding to Gamma 3 in the monitor’s menu. The tone response matches 1.8 with little deviation which is nice, although it is a bit odd when the previous screen of the colourimeter indicates we’re sitting at 2.25. C’est la vie. The monitor gets super dark at low brightness settings, with black measuring just 0.01 nits at 0% brightness levels. That’s good for an excellent 3160:1 contrast ratio, which dips to a more reasonable 600:1 or 660:1 contrast ratio at higher backlight settings. The Spyder4Elite typically under-reads contrast values, so we’re not too worried about this. Colour accuracy is next on the list, and again the XL2540 impresses. The monitor records one of the lowest Delta-E (error) values we’ve seen from a TN-panel display, averaging just 1.41. The vast majority of patches sit around 1.00 or below, with only that troublesome shade of teal causing any significant problems. You could probably use this monitor for most Photoshop or video work in a pinch, although a 100% sRGB IPS display would normally be a better choice. Some monitors have good colour accuracy in the centre of the panel, but suffer from poor accuracy in the corners. That’s not very true of the XL2540, which has relatively low Delta-E values throughout our measurement range. At a reasonable 50% brightness, the colour uniformity is at worst 1.4 in the upper left quadrant — not bad at all. 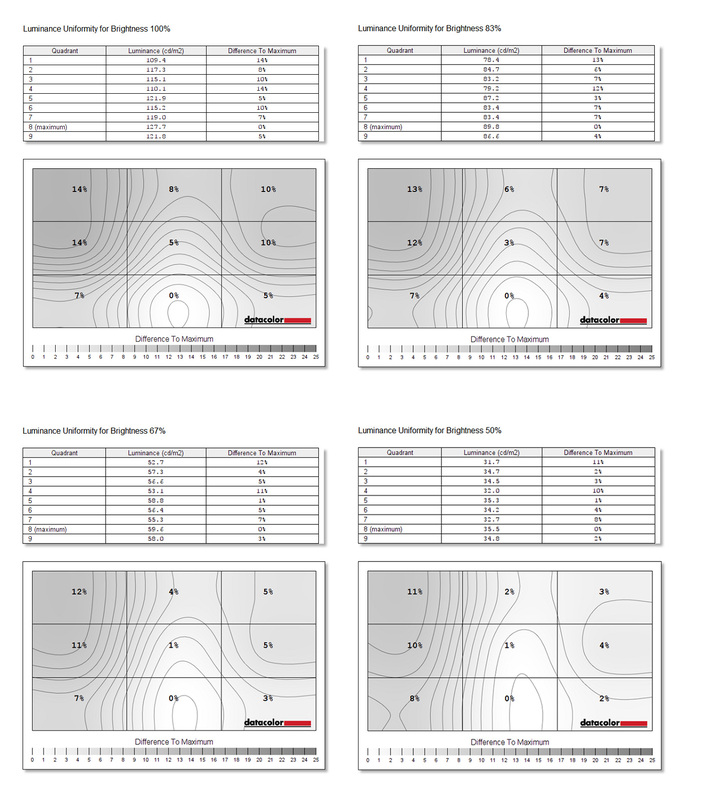 Luminance uniformity is also great, with only a 10% difference in brightness levels across different quadrants regardless of brightness settings. Overall, the XL2540 review unit we have in has a great panel with few defects. The colourimeter provides its own rating, so we’ll display it here for good measure. 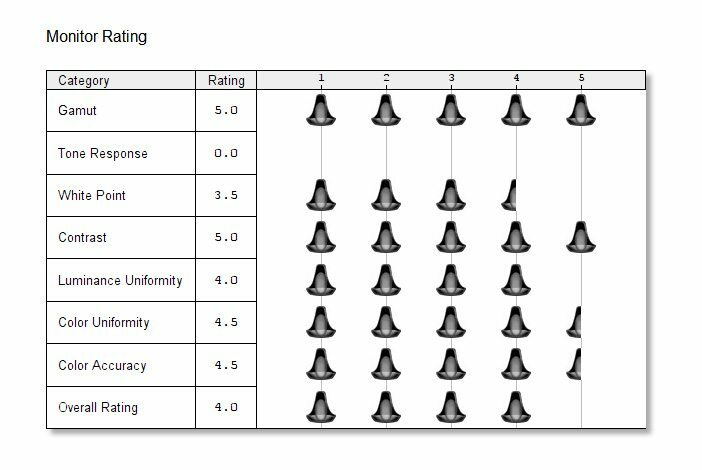 We can see poor tone response (as the result of the 2.2 target and the 1.8 actuality), but by almost every other measure the monitor is a strong one indeed. However, if your interest lies in popular esports titles, particularly shooters like Counter-Strike and Overwatch, and your PC can hit 200+ frame rates consistently, then you’ll have a ton of fun with the XL2540. 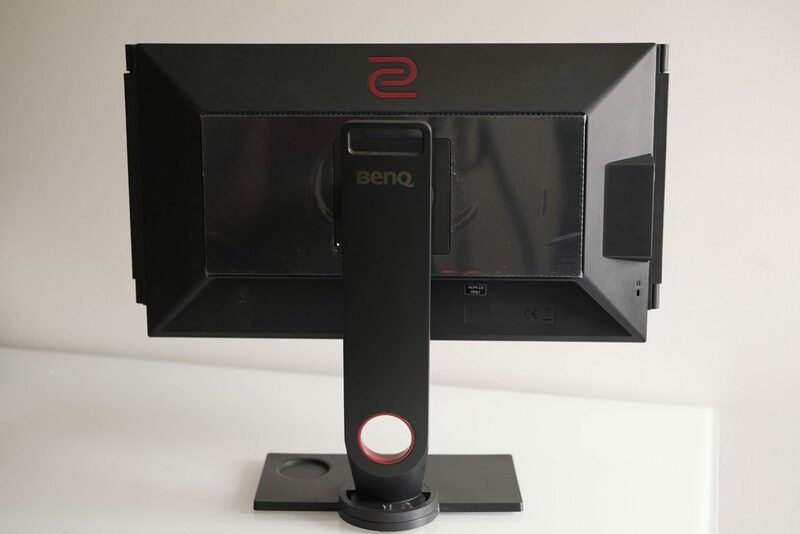 We can easily see this becoming the esports monitor of choice for gaming tournaments around the world, and truly competitive players of any fast-paced title should see big improvements moving from 144Hz to 240Hz. The blisteringly fast 240Hz refresh rate isn’t the only draw here either. It’s backed with comprehensively excellent OSD options, great adjustability and a surprisingly strong TN panel. Combined, you’ve got a truly top-notch gaming monitor. That’s why we’re happy to award the BenQ XL2540 Zowie our Editor’s Choice Award. Hello. Could you please provide the color adjustment presets for the calibrated monitor? RGB, etc. Sure, do you mean the hardware adjustments or software ones? Software ones are here: http://www.filedropper.com/benqzowiexl2540-1. For the hardware (OSD) settings, I don’t have the monitor any more, but it would have been on its standard setting (e.g. not gamer1 or whatever), gamma-3, User colour setting with all on 100. Again, I don’t have the monitor any more so I can’t check this unfortunately. Thank you. I am now using everything 100 and gamma 3. BlackEq, Color vibrance, and Low blue light settings are still a mystery. It’s up to your personal preference. Black equaliser makes it easier to look into dark corners, but changes the look of a level. Vibrance again makes things easier to spot, but it doesn’t look at all realistic. Blue light reduction might make it easier to get to sleep at night, but it turns things yellow. Try each one in turn and see what you like. Could you possible re-upload that filedropper file? Yes. I’ll be home on Monday (on holiday at the moment) and I’ll reupload the file then. AMD Lists this Monitor as FreeSync Compatible, so… this should not be a con… did you test it? You’re right, slip of the keyboard. Fixed now, thanks.